Rockstar Energy Suzuki World MXGP team rider Kevin Strijbos raced to second overall in the first round of the Belgian Motocross Championship at Moerbeke-waas on Sunday. The 31-yearold Belgian, who is still nursing painful lower-arm tendonitis, decided to start in Moerbeke to gain some additional race-time on the Factory Suzuki RM-Z450. The injury he picked-up pre-season proved to be a problem in all three heats, but despite the discomfort he still managed to find a rhythm in the first and third heat and ended-up on the second-step of the podium behind 2014 Belgian Champion Jeremy Van Horebeek. Alongside Strijbos aboard the Suzuki RM-Z450 was former World Champion Steve Ramon, who scored two sixth positions in the first two 20 minute-two-lap races heats. In the third heat he misjudged a rut in a corner and went down, crossing the line in 17th despite bending his radiators in the incident; and placing him eighth overall. "I raced here to see how my arm would cope - but even though it was better than the weeks before, it's a shame that it doesn't allow me ride like I could, and what I prepared for in the winter. We had a new scan today (Monday) and receive the results tomorrow to see how we go in the coming weeks. " "It went quite good - I was quite happy that I could follow the pace of the top runners in the first couple of laps but after a while I started to have arm-pump and had to slow down a bit. The riding is more intense in comparison to those endurance beach races that I have been doing in the winter, so I'm missing race-rhythm on races like this. We need to work on this for the next race of the Championship at Mons". Rockstar Energy Suzuki MXGP and the Rockstar Energy Suzuki Europe teams have shipped their RM-Z450s and RM-Z250s to Argentina for the third round of the FIM World MXGP and MX2 GP of the season in Villa La Angosturia. Red Plate holder - and Strijbos' team mate - Clement Desalle and his Rockstar Energy Suzuki colleagues will board the plane towards the South-American GP on Wednesday. Moto 1: 1: Jeremy Van Horebeek (Yamaha) 23:03:78, 2: Kevin Strijbos (Rockstar Energy Suzuki World MXGP) +03.443, 3: Jeffrey Dewulf (Yamaha) +04.414, 4. Ken De Dycker (KTM) +22.608, 5. Pauls Jonass (KTM) +33.907, 6. Steve Ramon (Rockstar Energy Suzuki World MXGP) +41.519. Moto 2: 1: Jeremy Van Hoorebeek (Yamaha) 23:11.783, 2. Ken De Dycker (KTM) +13.502, 3. Pauls Jonass (KTM) +24.219, 4. Jeffrey Dewulf (Yamaha) +27.879, 5. Kevin Strijbos (Rockstar Energy Suzuki World MXGP) +40.588, 6. 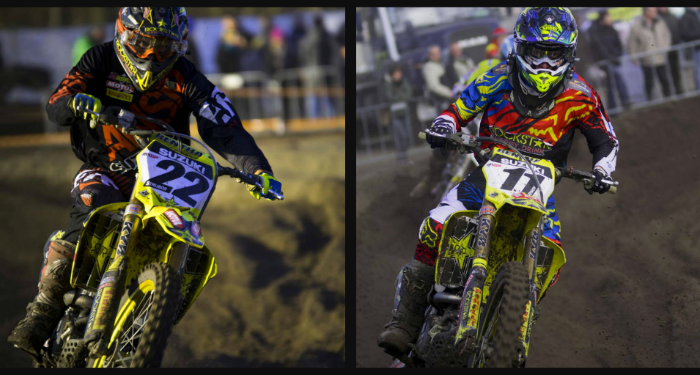 Steve Ramon (Rockstar Energy Suzuki World MXGP). Moto 3: 1: Jeremy Van Horebeek (Yamaha) 23:34:927, 2: Kevin Strijbos (Rockstar Energy Suzuki World MXGP) +00.448, 3: Pauls Jonass (KTM) +29.834, 4: Brent Van Doninck () +32.617, 5. Jeffrey Dewulf (Yamaha) +57.849. 17. Steve Ramon (Rockstar Energy Suzuki World MXGP) +1 Lap. Overall & Championship Standings: 1: Jeremy Van Horebeek 75pts, 2: Kevin Strijbos 60 pts, 3: Pauls Jonass 56 pts, 4. Jeffrey Dewulf 56 pts, 5. Yentel Martens 43 pts. 6. Jérémy Delince 41pts. 7. Ken De Dycker 40 pts. 8. Steve Ramon 37pts.